Most are very aware of the December 7, 1941 attacks by the Japanese on military installations on Oʻahu. Their targets were Pearl Harbor; Hickam, Wheeler and Bellows airfields; Ewa Marine Corps Air Station; Kaneohe Bay Naval Air Station and Schofield Barracks. However, the attacks by the Japanese on Hawaiʻi did not end on December 7th. A group of about nine Japanese submarines were kept in the vicinity of Hawaiʻi until mid-January – they were stationed there to find out just how much damage had been done to the American military. In addition, they tried to do what damage they could, as well as stir up concern in the civilian population about the war. Before December was over, the Japanese submarines brought war home to the neighbor islands. Not by air attacks, but with periodic shelling from their submarines. Over the next few weeks, on several occasions, they shelled more targets in Hawaiʻi – and, those attacks were not isolated to military targets; later in the month, civilian facilities were the intended targets. Just before dusk on December 15th, a submarine lobbed about ten shells into the harbor area of Kahului on Maui, and three that hit a pineapple cannery caused limited damage. Damage at all three points was slight, and no one was hurt. The principal result of these shellings was to stir up the war consciousness of all the Hawaiian Islands. On the bluff above the harbor, where the bulk sugar storage warehouse stands today, a shell started a small cane fire. Most of the shells were duds. One punctured a gasoline storage tank, others created water plumes in the bay. Merchant Marine William S. Chambers, on a cargo ship docked in Kahului, noted. “We were shelled by a Japanese submarine in Kahului Harbor on December 30th, 1941, shortly before we left for San Francisco.” No damage was reported at Kahului. Ten rounds were fired at ships docked at Kahului piers. Two shells fell harmlessly into the harbor. Four rounds hit the Maui Pineapple Company cannery, doing some damage to the roof and smokestack. One fell on the driveway of the Maui Vocational School, another in a waste lumber pile on Pier I, and one broke a few windows at the Pacific Guano and Fertilizer building. Army guns unsuccessfully returned fire. The second attack on Kahului, on December 31, took place after General Order No. 14 established wartime censorship in Hawai’i and therefore received limited coverage. The News did, however, mention in its first edition of 1942 that Maui police, navy and marine forces, as well as “HC & S Co. cowboys,” were patrolling on horseback to prevent looting. The death toll from the attacks: one unfortunate chicken. None of the damage was considered major. Some frightened Kahului residents started to flee, but police and Boy Scouts persuaded them to return home. In Hilo, residents were roused when a submarine surfaced about three miles offshore and open fired on Hilo Bay. Ten rounds, with high explosive shells hit a seaplane tender, the pier and started a small fire in the vicinity of Hilo Airport. In addition, I have added a few other images and maps of the areas targeted by the Japanese submarines in a folder of like name in the Photos section on my Facebook and Google+ pages. Pearl Harbor Historic Trail is a partially-existing heritage and recreational corridor that has the goal of establishing an 18+ mile multi-use recreational trail that will highlight historic sites from the USS Arizona Memorial to the west coast Oʻahu community of Nānākuli. The full Pearl Harbor Historic Trail is still only an idea, but there is already a multi-use trail from the Arizona Memorial parking lot to Waipi’o Point Access Road. The path is intended to be improved as part of the historic trail project. The long-range Master Plan (prepared in 2001) stemmed from the Aiea-Pearl City Community Vision Group’s Year 2000 project. The Pearl Harbor Historic Trail is a vital element in the Aiea-Pearl City Livable Communities Plan as its proposed projects for the area are integrated into the Plan. 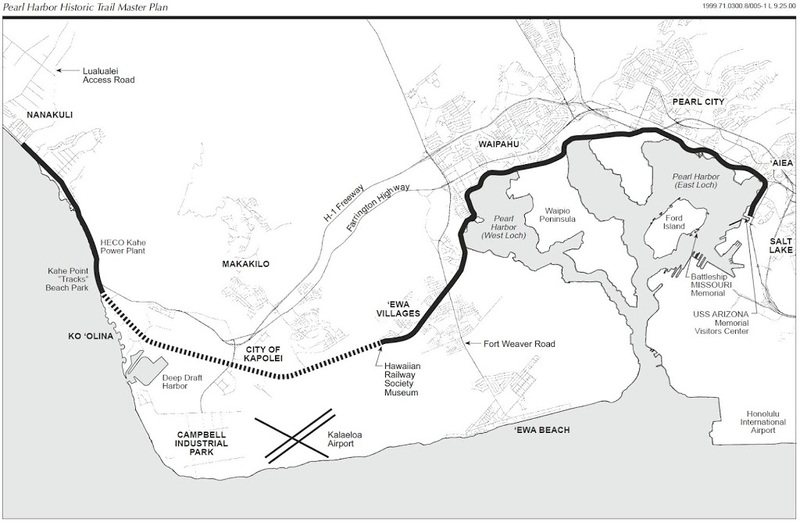 The former Oahu Railway and Land Company (OR&L) right-of-way is the foundation upon which the proposed Pearl Harbor Historic Trail will be built. A key project of the Master Plan is the re-establishment of the historic railway operation for the entire 18+ miles of the Trail. The Hawaiian Railway Society (HRS) currently operates a six-mile long narrated railway train tour between its Ewa station museum and Kahe Tracks Beach Park in Nanakuli. The Community Vision Group saw the 40-foot wide OR&L right-of-way as a valuable asset within their community that had the potential to meet a number of community needs such as safe bicycle and pedestrian paths, a natural and historic preservation project, a recreation resource, a means of opening up shoreline access, and an opportunity for economic revitalization. The Master Plan incorporates a combination shared-use path and railway that includes major components, attractions and activity centers that will establish the Trail as a world-class heritage and recreation corridor. The Trail will feature a continuous path for bicyclists and pedestrians alongside an historic train, diverging from the OR&L right-of-way where advantageous to take in shoreline views. Miles of greenway and bikeway connections and gateways to the path are proposed, enhancing access to nearby communities and attractions. A few years ago, Nelia and I biked from Aiea Bay State Recreation Area, first to the Arizona Memorial side, then to Waipiʻo Peninsula along the existing portion of the trail. At that time, it was in generally good condition; it is used daily by bikers, joggers and walkers. There are great views of Pearl Harbor, as well as other odds and ends along the way. The image shows the general route of the bike path; I have also included some photos of the bike trip we took a few years ago on the trail in a folder of like name in the Photos section on my Facebook page.